In contrast with the common belief that competition demands no State intervention, innovation policy and competition complement each other. This is the main conclusion of our investigation concerning innovation in the realm of renewable energy (RE), summarized in the OFCE Briefing Paper, n°8, October 6, 2014. By and large, innovation is the only answer to both sustaining current life standards and overcoming severe environmental concerns. This is especially true in the case of energy, where increasing resource scarcity calls for the rapid development of renewable energy sources, such as biomass, solar and wind. The issue is: despite this considerable increase, renewable energy can still not compete with fossil fuel, the production of the latter being cheaper and its distribution more efficient. Hence without a long-term perspective, the development of renewable energy cannot take place. Public support, it is well-known, is better equipped than private parties to take such a stance. And to understand which policy design may best spur innovations in renewable energy is a key question. Public policies aim to spur investments in green capacity and technical change and to reduce the cost of RE generation. The adoption of the Kyoto agreement on climate change mitigation too has created a consensus about certain environmental policies (i.e. emission trading schemes). 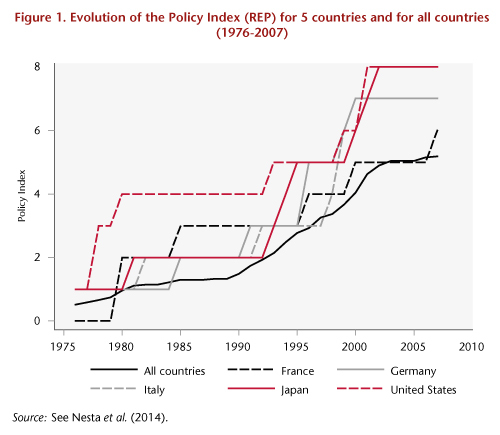 Over the past 20 years, OECD countries have increasingly supported innovation in RE by diversifying the range of RE policies (see Figure 1 for selected countries). Meanwhile, liberalization has changed the working of energy markets in most OECD countries. It has increased market competition by lowering entry barriers and privatizing energy producers. We view liberalization of the energy market as positive for innovation. Radical innovation is mainly developed by newcomers. And large incumbents have little incentive to fully develop new technologies that would question their past investments in large-scale energy production. In a context of amplified public support to RE innovation and increased liberalization of energy markets, it is important to test how the interplay between the two affects innovation in renewable energy. We find that renewable energy policies are more effective in fostering green innovation in liberalized energy markets. We find that such policies are three times as effective in highly deregulated energy markets than in more regulated ones. In general, this complementary effect is one of the largest drivers of innovation, especially for frontier patents. 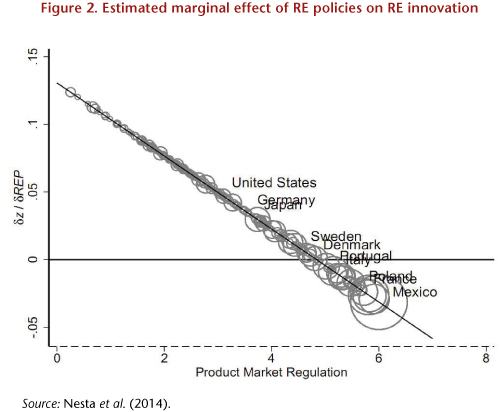 This result is summarized in Figure 2 where we depict the estimated effect of RE policies on innovation as a function of the degree of market deregulation. This effect is positive only for countries with a level of regulation below average, as is the case for Germany and the United States. Our conclusion is that the effect of RE policies on innovation is crucially mediated by the degree of competition in the energy market. Therefore, and again, in the energy sector, in contrast with the common belief that competition demands no State intervention, innovation policy and competition complement each other. This research project benefited from funding from the European Union Seventh Framework Programme (FP7/2007-2013) under grant agreement n°320278 (RASTANEWS). See: Nesta, L., Vona, F., Nicolli, F., 2014. “Environmental Policies, Competition and Innovation in Renewable Energy,” Journal of Environmental Economics and Management, vol. 67(3), 396-411.